This morning in the staff meeting, the teacher i/c international students announced a visitor next week from Qingdao. I quivered silently for a bit, but then I had to whisper to the woman next to me "I've been there!" She smiled, I have to say, thinly. Well, what are the odds - it's a small (by Chinese standards) port in the Yellow Sea and I was only there in March. I scored a cruise with the OH and some Aussie journalists on the Silver Whisper, a Silversea small ship, from Hong Kong to Shanghai via several ports plus a night in Beijing. At the Peninsula Hotel there. Which would have been impressive, had we not by then already spent two nights at the original Pen in Hong Kong, where we had a 6-room suite in the tower. Six rooms. With a hallway. Ankle-deep oriental rugs, quantities of televisions (including over the bath) and a telescope. And our luggage in the dressing room, spirited there, we scarcely having seen it since checking in at Auckland. We were met off Cathay Pacific's Business class at the airbridge, people! Then we were wafted through all the tedious airport stuff and conveyed to the hotel in a Roller. That was the plebian version of arrival, however: the real celebs helicopter onto the roof and disappear into the penthouse suite and it's as if they're not even there. Different story on the Silver Whisper - everyone knew who we were and used our names from the get-go. Necessarily more compact there, but also very luxurious - bottomless champagne in the free minibar, imagine that - and a great contrast to much of what we saw, a lot of it involving wheelbarrows and bamboo besoms. Qingdao was our last port of call before sliding up the river into the heart of Shanghai on the last morning. >>> ...A day’s sail south brings the temperature up again and when we dock at Qingdao I’m not shocked to see brides with bare shoulders posing for photos in front of St Michael’s Catholic Church, though when they gather up their skirts to leave, I’m equally unsurprised to see they’re sensibly wearing striped football socks underneath. Draped over a hill, this is a lovely town with a strong German influence, and when I wander through the lanes I could be in Bavaria — until, that is, I pass the hospital where brightly-coloured plastic bedpans are piled up next to buckets of flowers at a stall by the entrance. I visit a cavernous mansion and look at the Spartan bed where Mao slept, sniff the incense at a gaudy temple with fierce statues and a stuffed cat in a basket, duck under washing strung across the footpath and am thankful that it’s two o’clock and not noon when I discover that it’s a clock-tower I’ve just climbed at the Lutheran church. The people are friendly here, and I receive many greetings, including “Hello, foreigner!” from a party of schoolchildren. 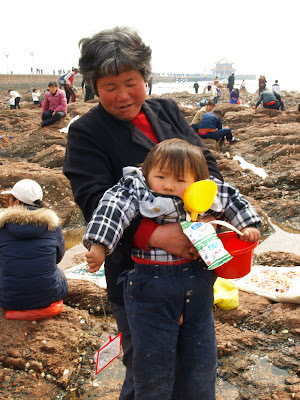 They’re chattering excitedly over their day at the seaside: the beach is swarming with people sieving rock pools with tea-strainers, sunbathing on the yellow sand, collecting seaweed and shells. I walk along the pier that stretches out into the bay, past stalls, photographers and magicians, to the pavilion at the end. I can see a pagoda, a cathedral, a communications tower, some skyscrapers, and lots and lots of people. I can see China. Oh, Lord, I'm such as tool of American propaganda. "St Michael’s Catholic Church," I thought, "Didn't the communists burn down all the churches in China?" Well, I have to say, it didn't look much used, apart from as a backdrop to bridal fahion shoots. Oh, my word, you're going to comment on all my comments, aren't you. Hmm, now who else does that? I'm only doing what I've been taught.